These tests were done to exhibit the CPU constraints when paired with a high end GPU. For this test we paired the A10 7890k (as it was the highest clocked Athlon/APU) with the EVGA GTX 980ti Hybrid and then did the same with the i5 6400 as it’s only $25 more than this A10. 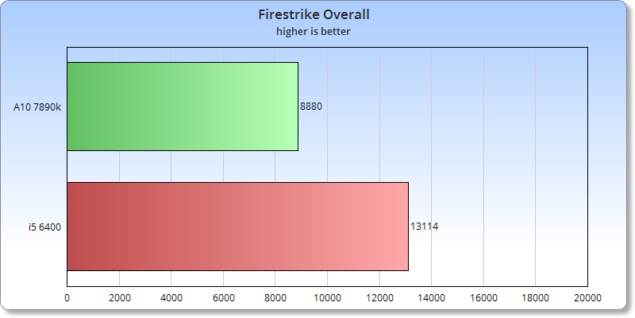 While testing with the GTX 960 we recorded the Overall score with 3dMark Firestrike since it gives a well rounded look at overall system performance. 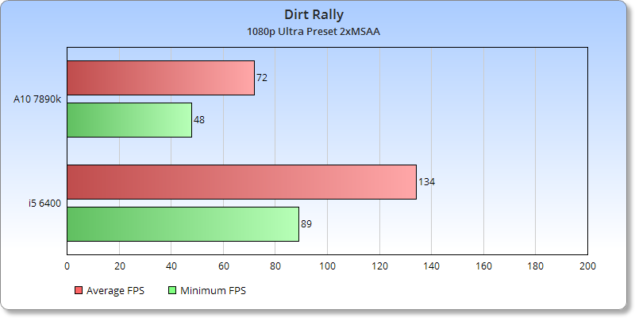 This go around with Dirt Rally we bumped the settings to 1090 Ultra with 2xMSAA and used the in game benchmark for our results. We ran this title at 1080p Ultra and played through the first 5 waves of Survival on Hoth. 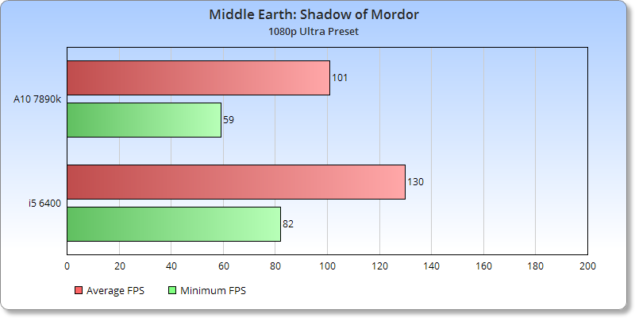 We ran Shadow of Mordor at 1080p Ultra Preset using the in game benchmark. 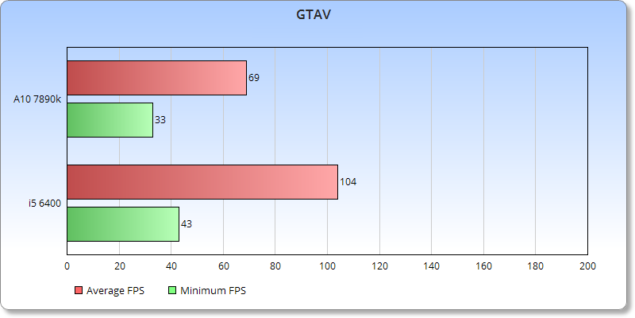 GTAV was set to 1080p with the game settings at Very High, Shadows set to Nvidia’s PCSS, and 2xMSAA. We used the in game benchmark to gather these results. At the end of the day the entire line up of Athlon x4 and A10’s are fairly capable processors. 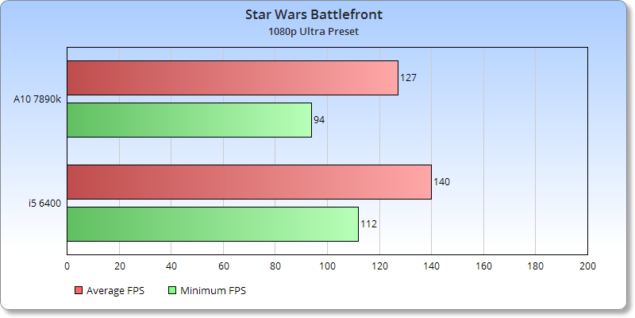 The R7 graphics handily outpaces both the HD4600 and the HD530. We also see that the Athlon x4s handle driving a mainstream GPU at 1080p with relative and comparative ease when put up against both the i3 4130 and i5 6400. That begins to change once you throw in a higher performance GPU and the i5 begins to stretch out and walk away. But I have to give a solid nod to the Athlon x4 845 for having the strongest cores of any of the Steamroller based Athon or A10s. While the 845 is still behind the i3 and i5 in raw CPU performance it’s quite impressive what the $70 CPU can bring to the table, and doing so at 65w which is really nice to see AMD doing. If anything can come from seeing how well that CPU does (remember, the lowest clocked Athlon/A10) then it bodes well for the performance of AMD’s upcoming Zen architecture which is claimed to be ‘greater than 40% faster IPC over Carrizo”. But guys…you didn’t include the A10 7890k and Athlon x4 880k overclocked results! Don’t worry, that is being handled in a separate article where we see just what kind of overclocking potential the included New Cooling Solutions will allow us to achieve.